The Zeigler family arrived from Pennsylvania, settling in Adair County, Missouri in 1859. They lived in the southwestern part of the County in a place later to be known as Zig. 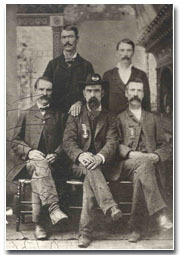 Several of the family members served in the Union Army during the Civil War. This collection contains letters written by Samuel Clark Zeigler during military service in Missouri and Arkansas with the 7th Missouri Volunteer Cavalry. Also included is a letter to John Zeigler from a friend [relative?] serving in North Carolina. The original letters were the gift of Steve Zeigler in 1985; they are complimented by transcripts provided by Odessa Ofstad. A second collection of letters were donated by the grandchildren of Ada Dail Zeigler Eschmann, Clark Zeigler's daughter, in 2007. Transcripts of the letters were provided as part of the donation. Additional information, including copies of letters, photographs, and transcripts, were donated to the department by Marvin Dean Linder in 1987 and 1998. Z1:1 Letters. Gift of Steve Zeigler, 1985. Z1:2 Letters. Gift of the grandchildren of Ada Dail Zeigler Eschmann, 2007. To Father [Harrison Ziegler] from S.C. Zeigler, Marshall, Saline Co., MO, 24 July 1862. *Photocopies only are retained in this folder; the prints have been transferred to the Photo Archives (Nos KP.0034-0036, Zeigler Family file) for proper care and conservation. Note: GAR Membership Applications for James L. and S.C. Zeigler may be found in Ms Collection D1, Papers of the Corporal Dix Post, Grand Army of the Republic.